Charles VII (6 August 1697 – 20 January 1745) was the prince-elector of Bavaria from 1726 and Holy Roman Emperor from 24 January 1742 until his death, in 1745. 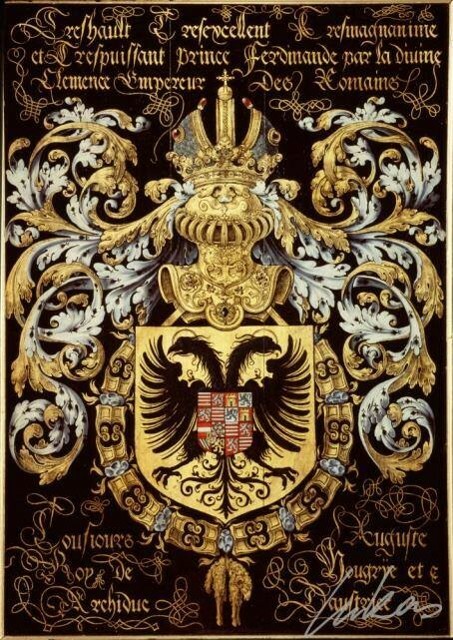 A member of the House of Wittelsbach, Charles was notably the only person not born of the House of Habsburg to become emperor in over three centuries (although he was descended from the Habsburg Philip I of Castile by 27 different ways). He was born in Brussels, the son of Maximilian II Emanuel, Elector of Bavaria and Theresa Kunegunda Sobieska, daughter of King John III Sobieski of Poland. His family was split during the War of the Spanish Succession and was for many years under house arrest in Austria. Only in 1715 was the family reunited. After attaining his majority in August 1715, he undertook an educational tour of Italy from 3 December 1715 until 24 August 1716. In 1717, he served with Bavarian auxiliaries in the Austro-Turkish War of 1716–18. On 5 October 1722, Charles Albert married Archduchess Maria Amalia of Austria, whom he had met at the imperial court in Vienna. She was the younger daughter of the late Joseph I, Holy Roman Emperor and his consort Wilhelmine Amalia of Brunswick-Lüneburg, daughter of John Frederick, Duke of Brunswick-Lüneburg. In 1725 Charles Albert visited Versailles for the wedding of Louis XV of France, and established firm contacts with the French court. 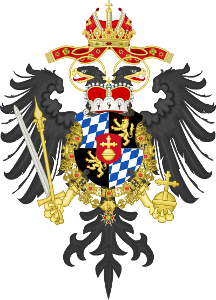 In 1726, when his father died, Charles Albert became Duke of Bavaria and a Prince-elector of the Holy Roman Empire. He maintained good relations both with his Habsburg relatives and with France, continuing his father's policies. In 1729 he instituted the knightly Order of St George. That year, he also started building the Rothenberg Fortress. In continuance of the policy of his father, Charles Albert aspired to an even higher rank. 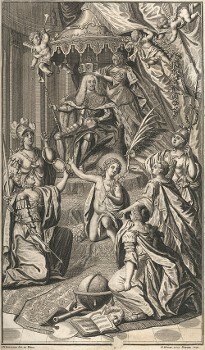 As son-in-law of Joseph I, Holy Roman Emperor, Charles Albert rejected the Pragmatic Sanction of 1713 and claimed the German territories of the Habsburg dynasty after the death of emperor Charles VI in 1740. With the treaty of Nymphenburg concluded in July 1741, Charles Albert allied with France and Spain against Austria. During the War of the Austrian Succession Charles Albert invaded Upper Austria in 1741 and planned to conquer Vienna, but his allied French troops under the Duc de Belle-Isle were redirected to Bohemia instead and Prague was conquered in November 1741. So Charles Albert was crowned King of Bohemia in Prague (19 December 1741) when the Habsburgs were not yet defeated. He was unanimously elected "King of the Romans" on 24 January 1742, also with the vote of George II, and took the title "Holy Roman Emperor" upon his coronation on 12 February 1742. His brother Klemens August of Bavaria, archbishop and elector (Kurfürst) of Cologne, who generally sided with the Austria Habsburg-Lorraine faction in the disputes over the Habsburg succession, cast his vote for him and personally crowned him emperor at Frankfurt. Charles VII was the second Wittelsbach Emperor after Louis IV and the first Wittelsbach King of the Romans since the reign of Rupert of Germany. Shortly after the coronation most of Charles Albert's territories were overrun by the Austrians, and Bavaria was occupied by the troops of Maria Theresa. The emperor fled Munich and resided for almost three years in the Palais Barckhaus in Frankfurt. Most of Bohemia was lost in December 1742 when the Austrians allowed the French under the Duc de Belle-Isle and the Duc de Broglie an honourable capitulation. Charles Albert was mocked as an emperor who neither controlled his own realm, nor was in effective control of the empire itself, though the institution of the Holy Roman Emperor had largely become symbolic in nature and powerless by that time. A popular Latin saying about him was et Caesar et nihil, meaning "both Emperor and nothing", a word-play on aut Caesar aut nihil, "either Emperor or nothing". Charles Albert's general Ignaz Felix, Count of Törring-Jettenbach was compared to a drum, as people heard about him only when he was beaten. 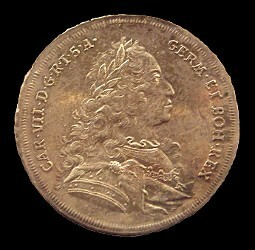 Charles VII tried to emphasise his government in Frankfurt with numerous acts of law, such as the grant of imperial privilege to the University of Erlangen in 1743 and the creation of several new imperial nobles. 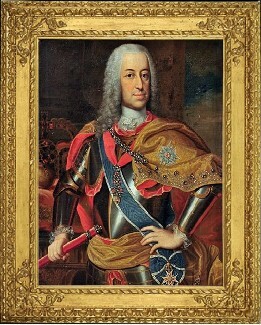 Charles Eugene, Duke of Württemberg was declared to be of full age ahead of time in 1744. Alexander Ferdinand, 3rd Prince of Thurn and Taxis served as Principal Commissioner for Charles VII at the Perpetual Imperial Diet in Frankfurt am Main and in 1744 the Thurn und Taxis dynasty were appointed hereditary Postmasters General of the Imperial Reichspost. The new commander of the Bavarian army, Friedrich Heinrich von Seckendorff, fought Austria in a series of battles in 1743 and 1744. In 1743 his troops and their allies took Bavaria and Charles VII was able to return to Munich in April for some time. After the allied French had to retreat after defeats to the Rhine, he lost Bavaria again. The new alliance with Frederick II of Prussia during the Second Silesian War finally forced the Austrian army to leave Bavaria and to retreat back into Bohemia. In October 1744 Charles VII regained Munich. Suffering severely from gout, he returned, but died three months later. His brother Klemens August then again leaned toward Austria, and his son and successor Maximilian III Joseph made peace with Austria. With the Treaty of Füssen Austria recognized the legitimacy of Charles VII's election as Holy Roman Emperor. Charles Albert is buried in the crypt of the Theatinerkirche in Munich. 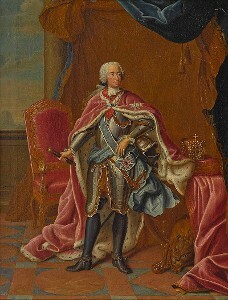 Charles Albert's reign was the height of the Bavarian rococo era. François de Cuvilliés was appointed chief architect of the court and constructed the Amalienburg in Munich. The Nymphenburg Palace was completed during Charles' reign: the grand circle (Schlossrondell) of baroque mansions was intended as a starting point for a new city (Carlstadt) but this was not achieved. 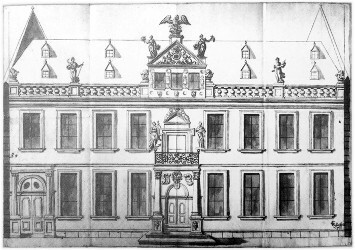 For the Munich Residence, Charles Albert ordered the building of the Ancestral Gallery and the Ornate Rooms. He also ordered Cuvilliés to construct the Palais Holnstein for one of his mistresses, the Countess Holnstein. Among the most gifted Bavarian artists of his time were Johann Michael Fischer, Cosmas Damian Asam and Egid Quirin Asam, Johann Michael Feuchtmayer, Matthäus Günther, Johann Baptist Straub and Johann Baptist Zimmermann. Charles VII, by the grace of God elected Holy Roman Emperor, forever August, King in Germany and of Bohemia, Duke in the Upper and Lower Bavaria as well as the Upper Palatinate, Count-Palatine of the Rhine, Archduke of Austria, Prince-Elector of the Holy Roman Empire, Landgrave of Leuchtenberg, etc. etc.